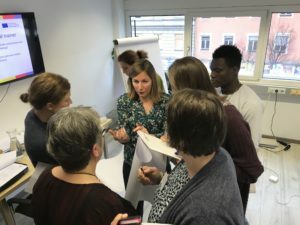 The German partners, DVV and BUPNET, were invited to provide a workshop in the framework of the conference entitled Angekommen in Deutschland – was nun? (please find the documentation in German here) organised by the German NA. After a short introduction into the project, Sabine and Beater presented the concept of “integration” and the different competencies associated with it. The aim is to evaluate and visualise these competences using the LEVEL5 validation system. This has already been developed in various previous projects. The participants were given an overview of the LEVEL5 reference system and its application in the VIC project. Then all participants were given the task to firstly assess themselves in terms of their knowledge, skills and attitudes using the reference system for the competence “Intercultural Communication”. This self-assessment was then jointly evaluated and discussed – with the participants finally agreeing that a well-founded self-assessment is indeed difficult, but at the same time helpful and valuable.